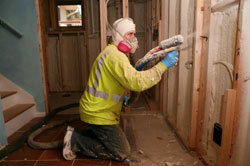 Finding go-to commercial insulation installers can make a world of difference for your business. Imagine always knowing that you’ll get quick, quality work with one phone call from a company you can trust. That can be a reality with Arango Insulation. We have nearly a decade of experience insulating everything from single family homes to massive hotels, so we know what it takes to get the job done correctly and quickly on the first take. We pride ourselves on quick service across the Southeast from Memphis to Miami and everywhere in between. We offer next day service on many jobs, and most of our commercial contracts are completed in one to three days. It’s not just our experience, but our wide inventory of products that allows us to move fast. Call or email Arango Insulation today to hire our expert commercial insulation installers and to find out more about the other services, including commercial roofing, we offer to contractors and builders across the Southeast from Atlanta to Myrtle Beach and beyond.